We started our trip with a vintage run to Stanstead airport on board 'premier' 317's in time to make our Ryanair flight at 13:50 to Brno. At departure time passengers were still disembarking from the flight however boarding was conducted without too much fuss. Being near the back of the queue I was in prime position to have my 'large carry on bag' checked into the hold- As taking the carry on bag is purely a cost saving exercise this was no problem at all except for one member of our party who checked his bag into the hold with his boarding card and passport still inside it! There was a minor faff while we resolved this and also the issue that I had booked extra legroom for myself (short) rather than the person in our group that actually wanted it (tall). Once airborne the pilot had the audacity to announce that our boarding had been intentionally delayed as we had been allocated a later runway take off slot- nothing to do with the fact that there were still passengers from the inbound flight on board then? As ever landing at Brno was uneventful and we were quickly on the bus into the city. Checking into our hostel took a little longer than planned due to a slight overshoot on my part which resulted in us walking almost out of town completely- I was sure our accommodation wasn't that far out! 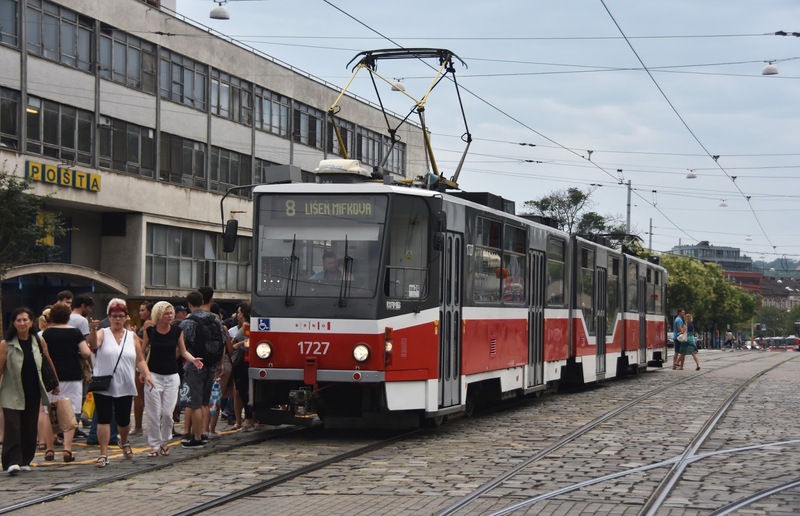 Finally onto some trains and due to digging we headed straight to Brno Zidenice by tram. We saw a couple of loco movements and a freight while the non-FIP contingent of our group purchased his 5 day ticket (working out around a whopping £30!). Two of the group then headed off on 242 243 while the other 3 of us held back in the hope of some Laminatka action. Light descending and no Laminatkas in sight we then headed the opposite way with 242 217. This didn't seem to be in my diagrams and we were slightly surprised when the train terminated at Brno Modrice (we were only planning to go one stop further anyway). 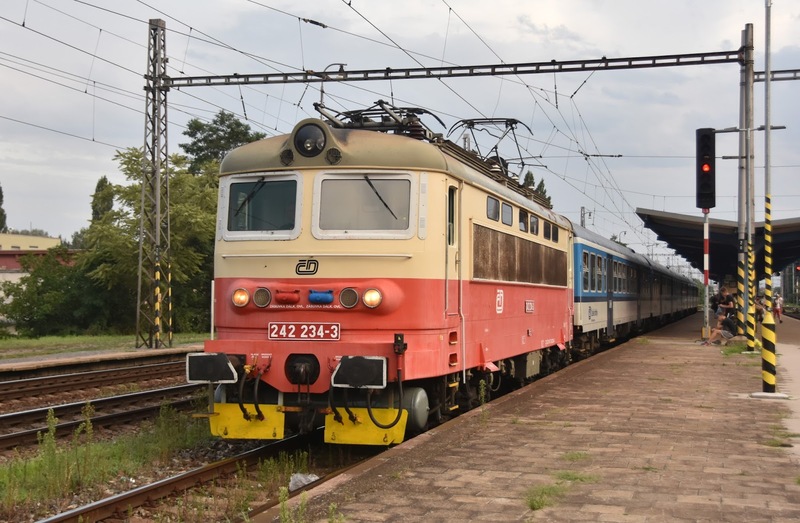 The loco came off and a very smart 242 260 backed on for the run back to Brno Zidenice. 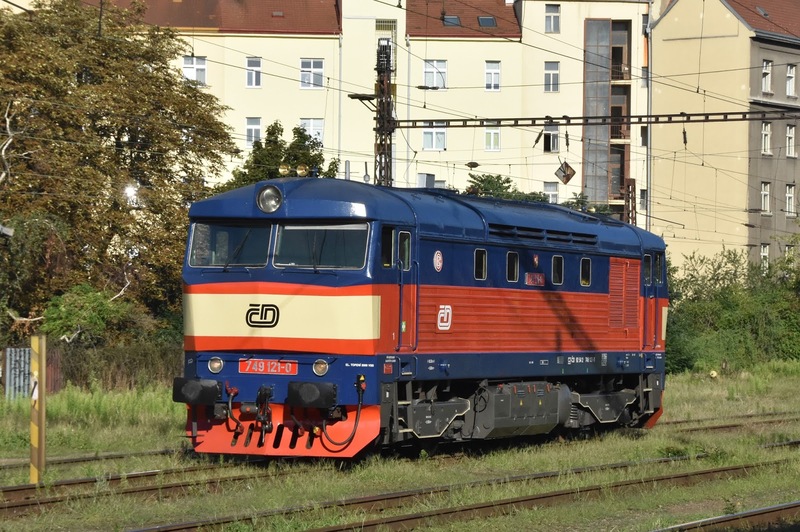 I thought all these locos were slowly going into blue/white but this one appeared freshly painted in red/cream. In fact most of the locos we saw were in the older/nicer scheme. We wasted some time back at Zidenice in the supermarket which made us quite late into the town centre for dinner. Had an awful Calzone before heading to the Brno beer festival which we had stumbled upon while looking for dinner. As it was very late there was only time for a pivo or two before we retreated back to our hostel shortly after midnight. We passed a few bars on the way and after a change of clothes accidentally ended up heading 'out out'. Oops. bags can be seen on the near platform! Slightly sorer heads than we had planned this morning but we did all wake up as booked. Not long after waking up the rain began. The plan was to do a few spins out of Brno before heading to Prague however the weather (it was really chucking down) left the idea of standing on stations somewhat less favourable. We grabbed some breakfast from the station and looked for a move- the 0920 to Plzen via Jihlava with 750 704 seemed a good bet. We took it a good 45 mins to the first shack of Namest nad Oslavou- unfortunately the train passes the return loco hauled set 5 minutes out leaving us on a DMU and hauled coach back to Brno. 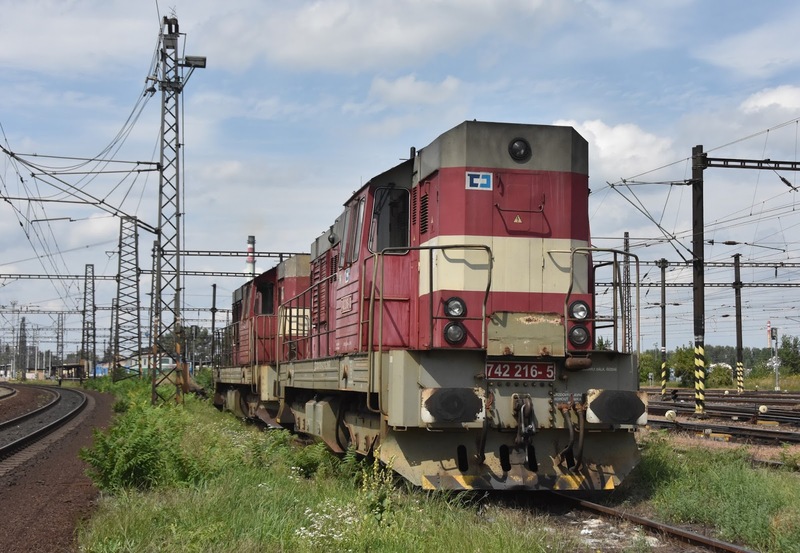 Retro liveried 362 001 pauses on its way to Sumperk. 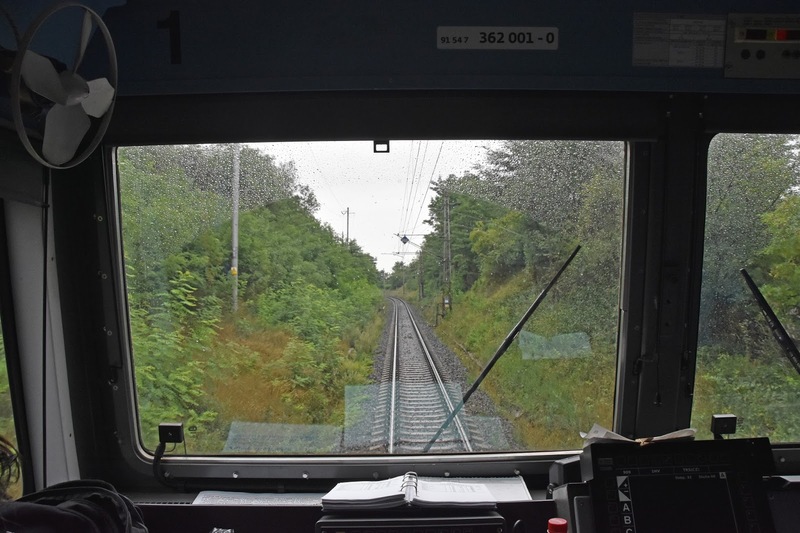 The cab view from 362 001. We had quite a quick + 5 or so at Brno to pick up 362 001 (in its wacky old livery as ES499 1001) on the 11:18 to Sumperk/Jesenik. 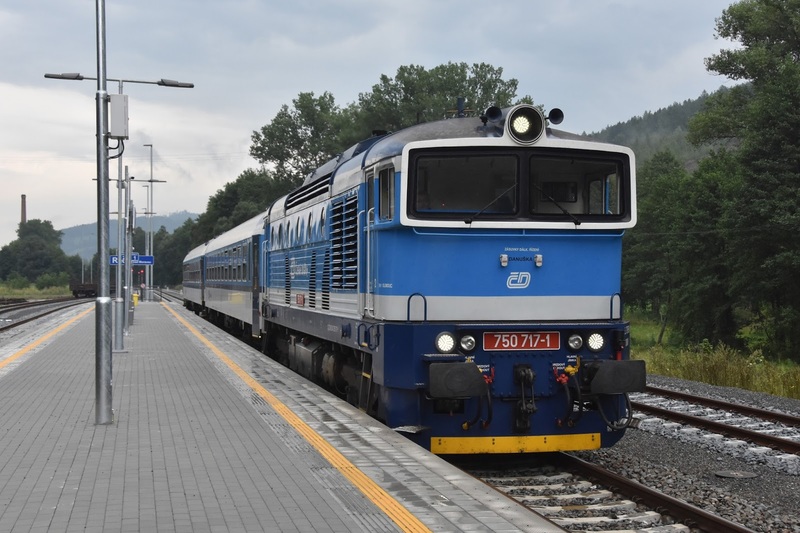 A few photos were taken on our way at station stops and we did also finally pass a Laminatka 230 051 at Vyskov na Morave. A vew stations later upon returning to the train from another 'photo stop' the driver beckoned two of us into the cab... this was misunderstood by persons number 3 and 4 and before we knew it the driver had 4 of us in the cab accompanying him for the next 30 mins or so! 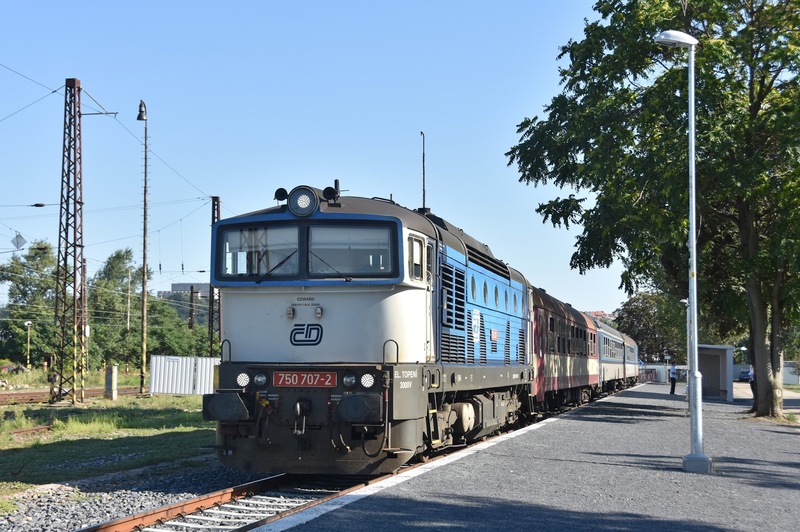 It had stopped raining, but of course when we arrived at Zabreh for the train to split it had started again. 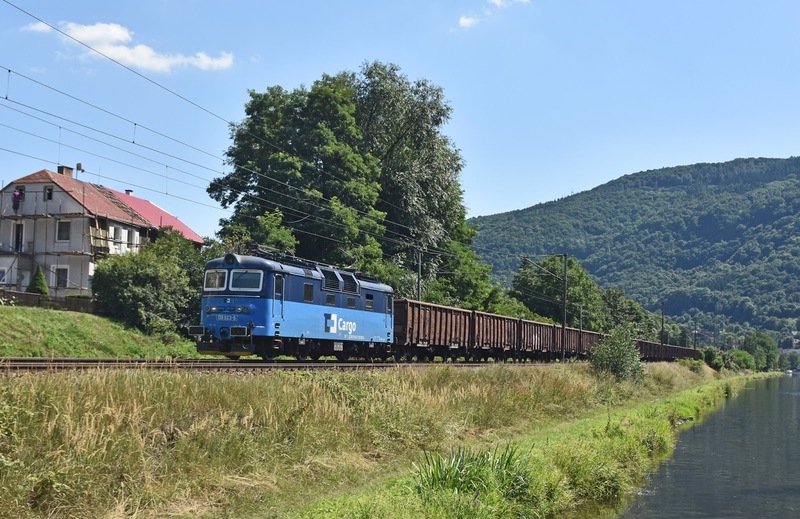 We had come this way in the as we had gen that our portion on to Jesenik would be worked forward by 749 265* and sure enough the grumpy was waiting in the headshunt to back onto our half of the train. Of course I wish it had been loud but it was nice to get a grumpy I wasn't planning to see, and a new livery for me as well. 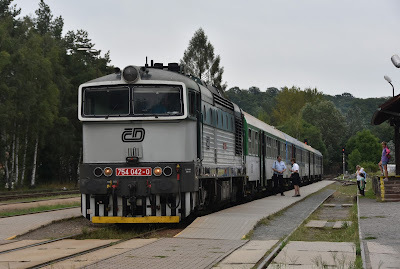 We took this to Ruda nad Moravou for a +20 or so into 750 717 back to Zabreh (not raining this time). A grumpy and two goggles down and we hadn't made it to Prague yet! ZSSK 350 006 took us on to Pardubice- perhaps there wasn't time to have pancakes in the restaurant car but the temptation was too much! The sun had now come out and we spent a pleasant 40 minutes or so the highlight of which was AWT Goggles 753 009 and 753 739 on tanks. 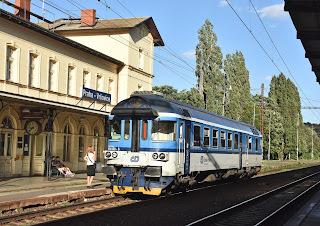 Our next move was to pick up PKP EP09-033 into Prague, check into our apartment and head to Praha Liben before the sunshine which had finally arrived gave way to night. Several Polish EP09's make it to Prague, we were brought in by EP09-033. Had we got to Liben an hour earlier we might have got some really nice shots, as it happens we saw a few freights before the sunlight faded. As we were leaving the station one of the elderly class 451 EMU's pulled in- out of the bushes appeared a group of about 5 youths, most with spray paint, one with camera and tripod who proceeded to start re-liverying the train! An impressive operation but not really what you want to see. We headed back to the main station and met up with our other British contingents James and Ian for dinner in one of the 'Railway' pubs. 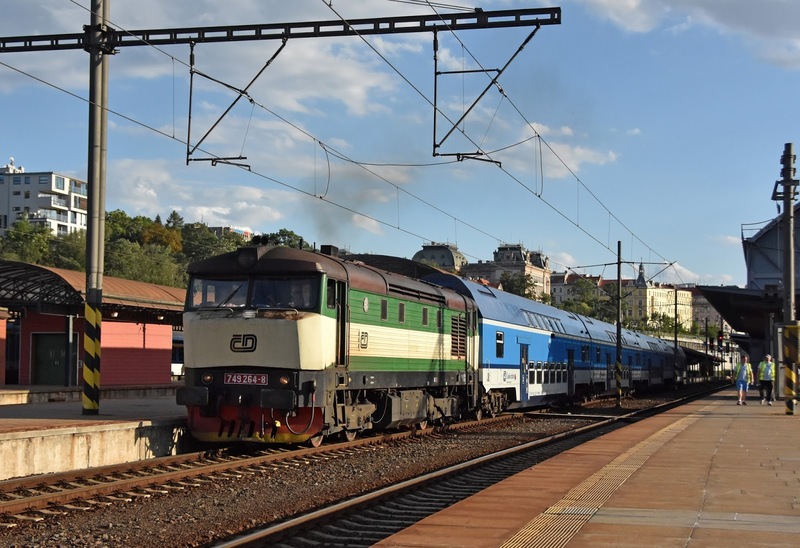 It was great to have our pivo's delivered by train but aside from that the food and service was a little underwhelming. Most of our group had not been to Prague before so we walked off dinner around the old town... before we knew it the time was gone 01:00 again. After another late night not all of the group fancied the early start for the desperate leap to Praha Vrsovice on the 07:39 KZD special to Cercany. 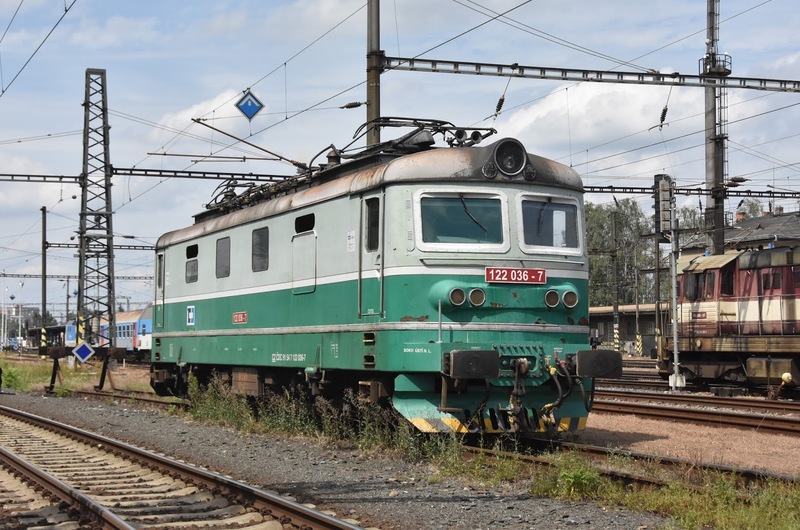 We knew this train had produced a 740 on some occasions but the gen was that it was most likely to be a heritage DMU. It turned out that our walking route to the station was longer than we thought with a run being required for the last bit. As it happened we needn't have excerted ourselves as the stock was not at the station. Thankfully the effort paid off with 740 692 rolling in on two trailers. 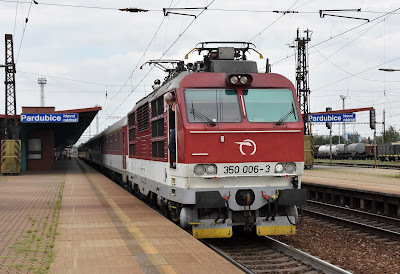 An excellent train and the run to Vrsovice was really far too short- beers were already being poured but there wasn't time to buy tickets- a 100Kn note was left for the 3 of us, an overpayment I'm sure but still not bad value. 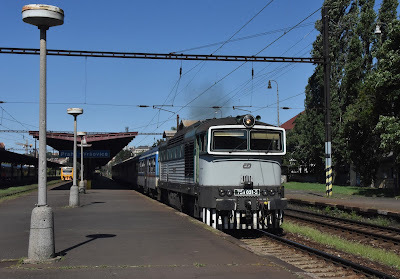 all I saw of it on this trip parked at Praha Vrsovice. 05/08/2017. Our move back to the main station was set to be another desperate leap with 749 121 which was due to work the CD special to Turnov. 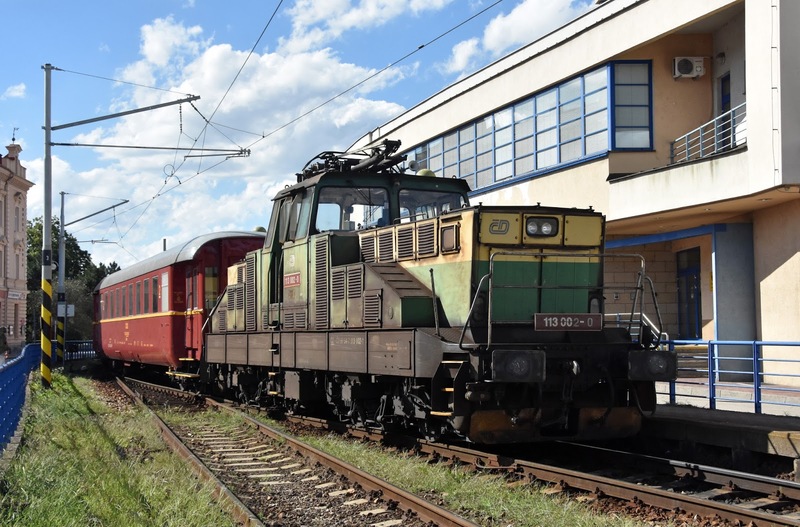 On arrival at Vrosovice was 749 121 resplendant in the sunshine, but shut down, and no stock. 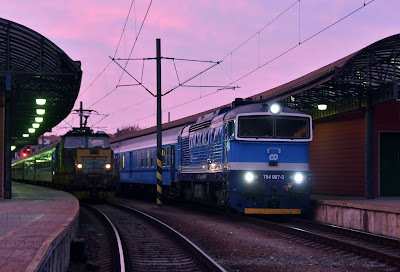 Clearly the Turnov wasn't going to be starting on time and we needed to be back at the main station for the KZC Grumpy turn to Rakovnic. We had a bit of time to play with but not enough to wait for the Turnov- alternative traction would be required so we took the next hauled train back to Hl.N with 362 083. 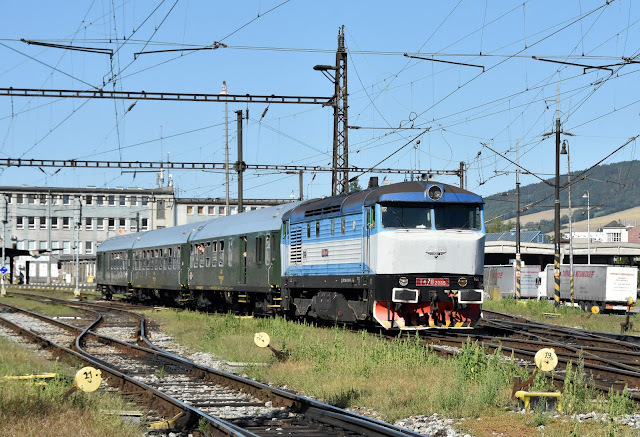 T478 2065 (749259) bucked the trend of late 'crank' trains being ready in the platform for the 08:42 run up to Rakovnic. The two of our party who hadn't got up for the 740 cut it a little fine and were still running down the platform as the Grumpy tooted it's horn for departure. Of course they made it just (somehow they always do! ), they certainly would have regretted missing it when they had heard the departure if they had not! CD Cargo 742 069 and 742126 in the yard at Beorun. It was a pretty good run to Beorun where we had to disembark to continue with our plan for the day. I'd have loved to continue right up to Rakovnic but with the diesel back in to Masarykovo unavailable due to digging there wasn't much of a move back to Prague- anyway- we had other targets in sight. 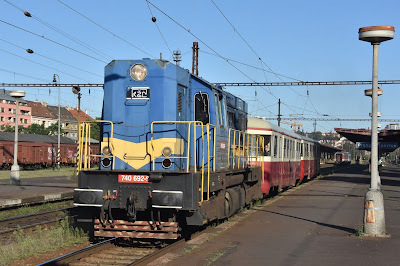 After bothering a pair of 742's in the yard at Beorun it was back to Prague with 362 086. There was just time to pick up 754 031 on the 10:55 Cercany and make our way back to the main station behind 350 006 (which quickly transpired to be an ECS movement!) 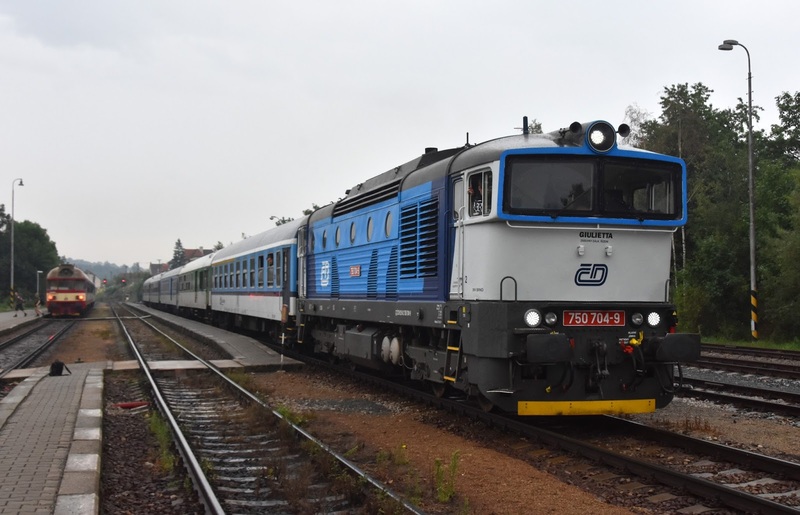 and then off to Tabor on a wedged service to Ceske Budovice behind 362 127. With absolutely no seats in standard we elected to fill a 1st class compo. The formidable gripper wasn't impressed but eventually got the idea after some waving of money that we were quite happy to buy a 1st class ticket. It was a good move costing us next to nothing each for seats and comfort! We had quite a tight connection at Tabor for the train to Bechyne. Or at least it should have been. The previous arrival was showing on the board as being around 80 late, and it turned out the next run from Tabor was to be a bus... not the booked heritage electric, which had apparently failed. This presented a problem. 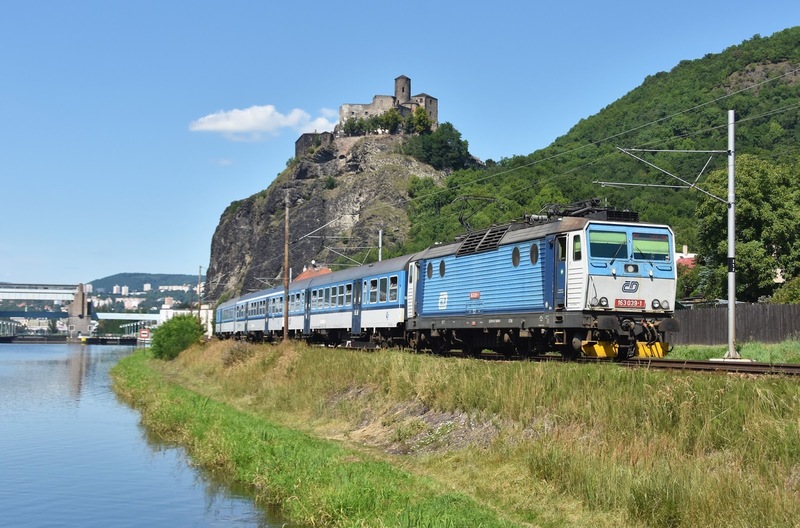 We had no intention of covering the bus and doing the later run would not allow us to cover the next part of our move, the 720 'cycle ex' on its return from Pisek. 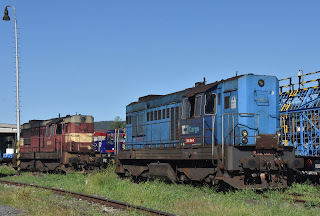 720 097 at shunts at Tabor having completed it's days work. 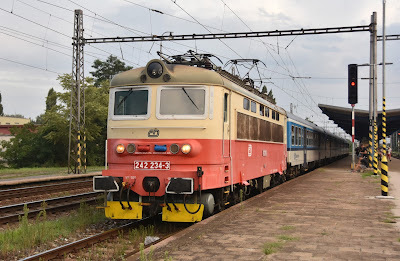 The choice in the end was quite simple- we abandoned the run to Behcyne and headed straight onto the DMU up to Pisek to cover the 720 in its entirety rather than another leap at the Tabor end. I'll confess I wasn't convinced in advance by the 720, which I saw as something of a 'glorified shunter'- but the ancient (1920's) balcony stock and the scenic line certainly made it worthwhile. 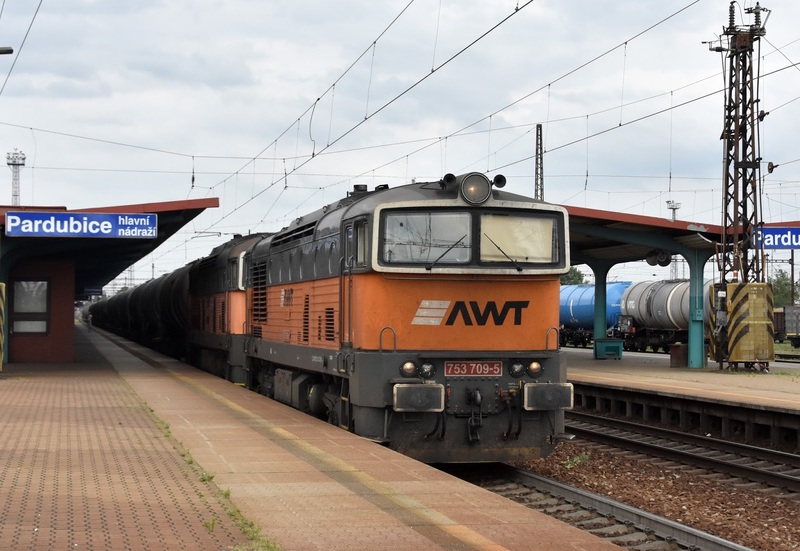 We had a little concern at Pisek when the redcap stopped us taking photos from the platform- but turns out this was only to get us out of the way of a departing train afterwhich we were welcomed back to wander over the track! A few minutes before departure from Pisek I decided that what we really needed were ice creams. A quick look around the station revealed no ice cream establishment- but there was a Tesco just across the road. 5 minutes until departure- is that time to run to Tesco and get ice cream? Yes- it is apparently. But only just- thanks to the guy who let me in front of him in the queue as well. Ice cream in hand it was an enjoyable run back to Tabor on the wooden coaches standing on the balcony behind 720 097. There is a particularly impressive viaduct over the Vltava river to look out for as well- all in all a top little journey. 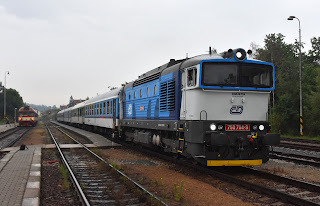 We definitely didn't make it up for the 09:22 Prague to Cercany with 749 121. 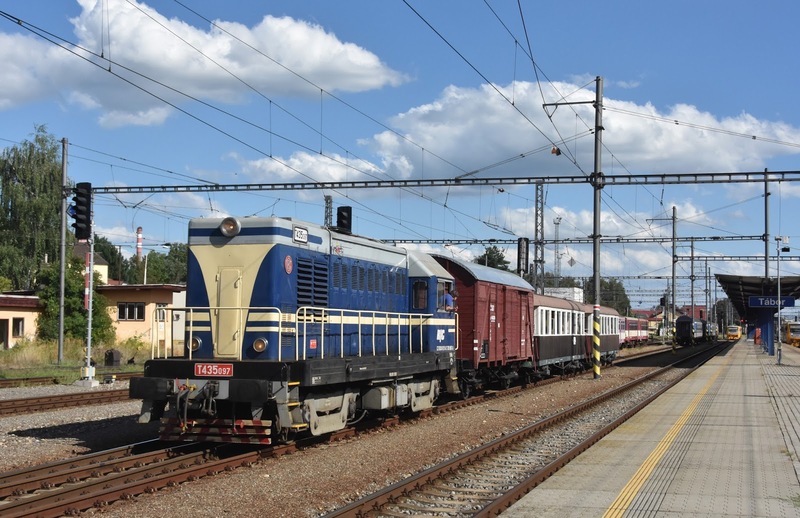 I headed off on my own to 'rescue' the day shortly before midday heading out to Kolin with 151 007 on the 12:22 to Zilina. 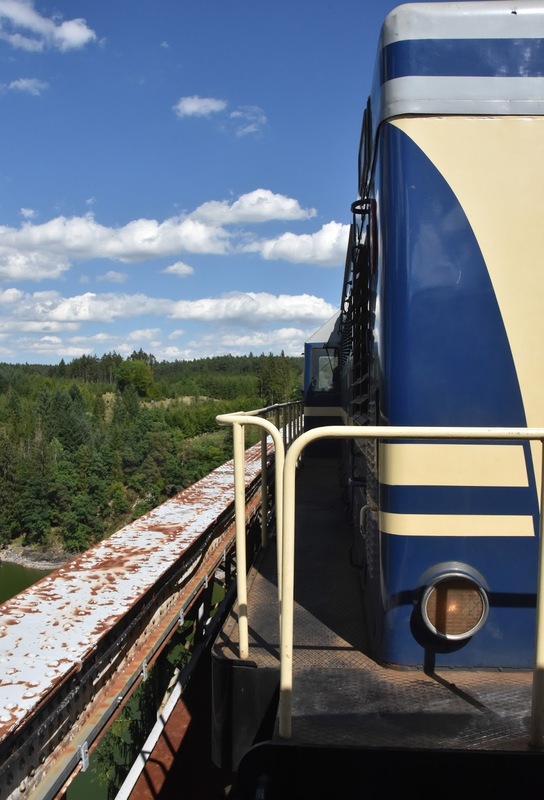 The portion of this train which was continuing across the border was wedged however towards the back of the train was plenty of space and some fresh air coaches. 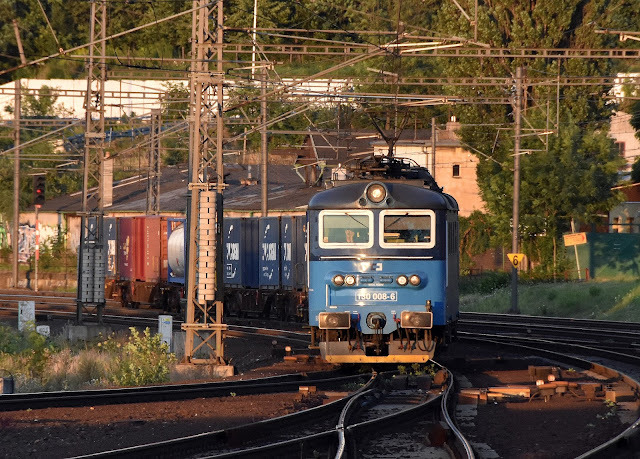 I had almost an hour to spare at Kolin during which time several freights were seen including some of the old Skodas. In one of the last patches of sun before it disappeared for the day 130 025 takes car carriers through Kolin. 06/08/2017. 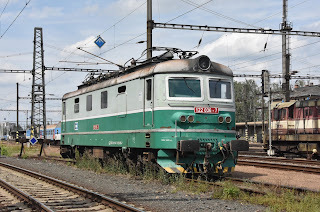 There is something about a green Skoda- 122 036, Kolin. It was then onto another small DMU for the run down to Zruc nad Szavouz. 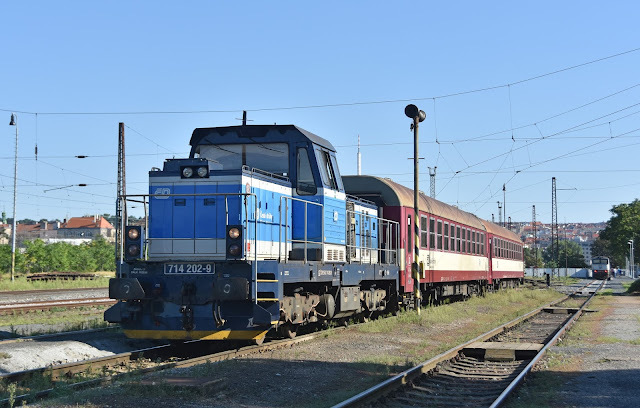 One of the main targets of this trip was 749107 which I had flagged in error on my previous trip to Prague. 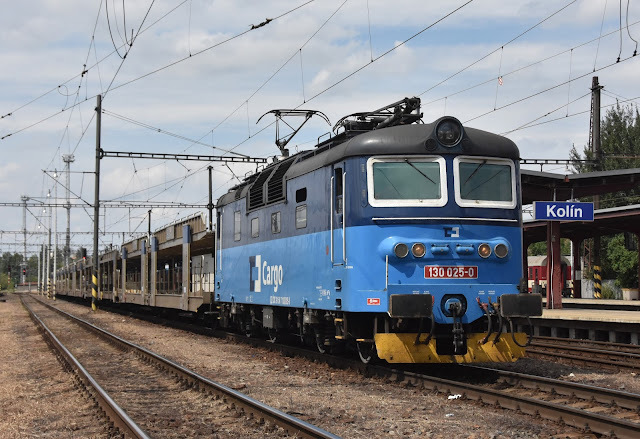 The gen I had was that it was the loco outbased at Cercany and I had therefore worked out that it should work the afternoon 14:59 train from Zruc to Prague as far as Cercany. While on my way I got some info from a friend that there was digging on the line and the first part of the journey was by bus. It was with a mixed reaction therefore that I turned up at Zruc to find 742 042 standing with stock with the train, re timed to leave at 15:20. So I had my train and no bus... but I didn't have my Grumpy. The run was pleasant if uneventful and I was joined by the rest of my group on Cercany who had spent the afternoon with 749 121 on it's booked turn. The logo on Sp1832 is booked to swap at Cercany and 749107 had appeared on shed. Would I get it after all? No, the Goggle ran around and continued with the train back to Prague. 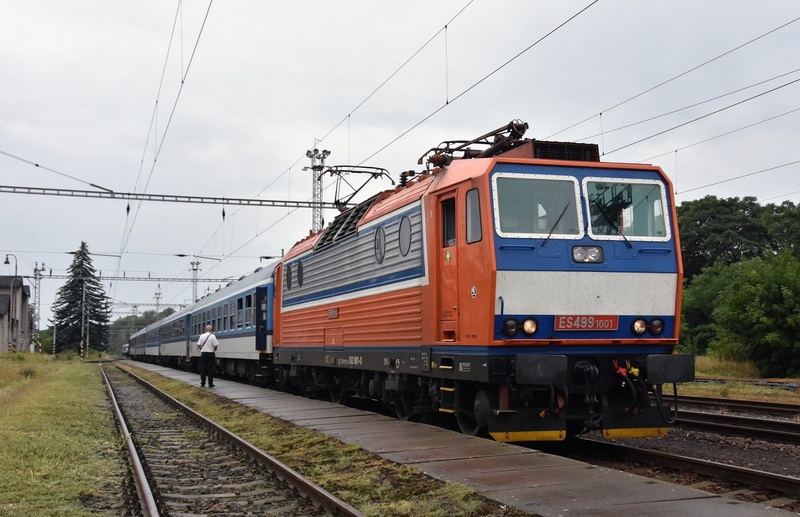 On investigation later I realised what must have happened, 749107 had clearly worked the 'other' train from Zruc, the 13:41 train from Svetla nad Szavous which I hadn't even realised worked through Zruc from the diagrams. I must have just missed it at Zruc as well! Oh well- you live and learn, and clearly shouldn't plan your moves in 10 minutes before going on a pub crawl the night before! There was one final move before dinner, to pick up 754 007 on the inbound turn from Tanvald. 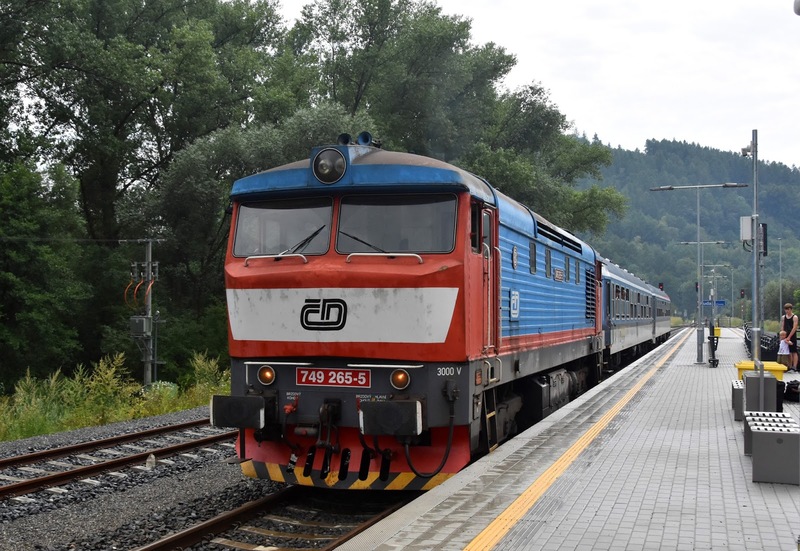 A DMU was taken out to Prague Cakovice in order to pick up R1149 15:51 Tanvald - Prague Vrsovice- 754 007 providing about the best noise I have ever heard from a Goggle- and it still wasn't much! 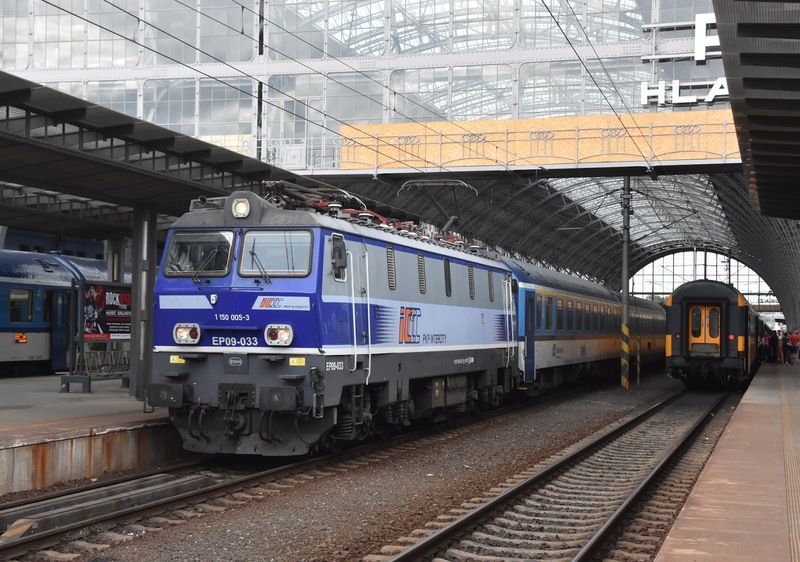 R1149 15:51 Tanvald - Praha Vrsovice waits time at Praha Hl.N. Tatra T3 is one of the hundreds in regular service in the city. 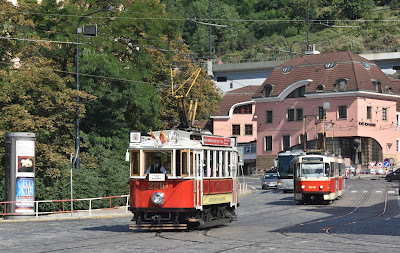 This morning it was time to explore a bit of the city and catch some of the lovely Tatra T3 trams in action. 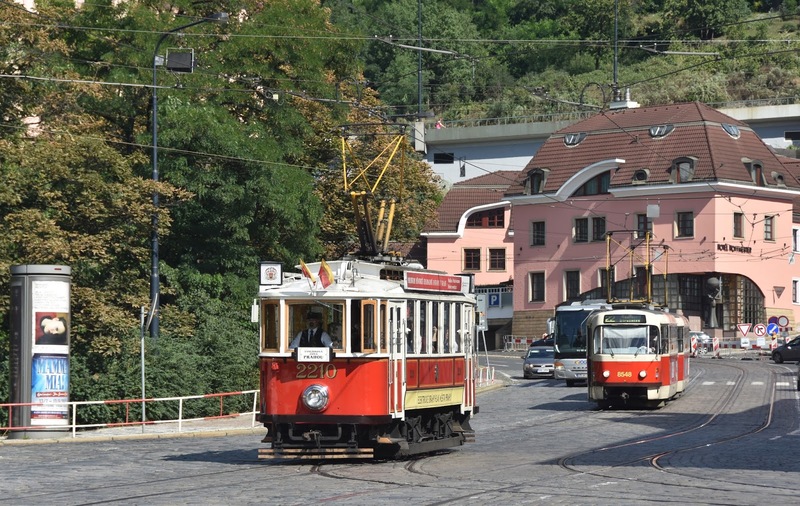 We were also lucky to catch heritage tram 2210 dating from 1932. Our adventures in the city done it was time to check out of our accommodation and head back to the station and onto the 12:48 to Cheb which we would take to Usi nad Labem. Traction for this train was not what we were expecting with Vectron 193 270 working the train as far as Usti nad Labem. We were here for photos and embarked on the roughly 40 minute walk along the river to Strekov. We didn't have long and the traffic levels were disappointing. In around 90 minutes we only saw one southbound train (though several more did pass northbound). Clearly this is a location one needs to invest some more time in and I am sure that I will be back. Our return to Prage was behind 150 224. 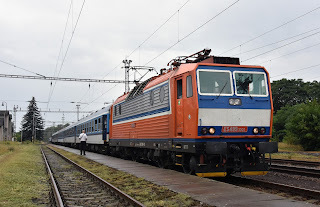 It was now time to start thinking about heading back to the airport but there was a final chance for a diesel. With digging on the viaduct from Masarykovo the evening diesels are currently leaving form Praha Bobny (near Vltavska Metro station) where an additional temporary platform has been constructed. We were hoping to pick up a 714 but the timings didn't work. 750 707 was sitting waiting for the 17:05 to Raknovice whereas there was no indication of when 714 202 further up the station may leave. I tried to ask the station shunter about the 714 and he indicated that it was not the next train. 750717 therefore became the last diesel of the trip on this surprisingly run down and neglected route around the suburbs of Prague. The 191 airport bus continues from Prague Veleslavin. Our flight home was at 19:50 with Wizz to Luton. We had maybe cut things a bit fine to head to security at the gate but thankfully everyone made it through and we were homeward bound. A really enjoyable trip with a good group of friends- though it has to be said the larger the group the more difficult it is to get everyone through the bathroom and out of the door! 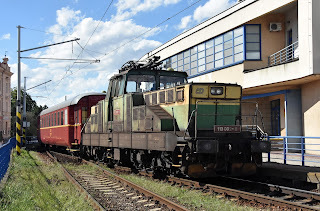 It is good to see a reasonable amount of Grumpy action still up for grabs in the Summer from Prague as I hadn't honestly expected to get another ride with these locos following my trip in 2014. It was frustrating to miss 749107 again, especially once I realised back home what it had actually worked! It was also a little disappointing to only get one run with a 'loud' machine- but then that is partly my error for failing to get up for 749121 on Sunday morning. There is plenty still to do in this wonderful country and I am already looking to see when I can arrange another trip. Thanks to Jon, James, Rhys and Matt for the company and various contributions to the planning and realisation of this trip- it was a good one!